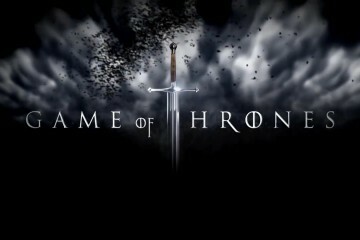 The episode starts with Jamie Lannister reading Ned Starks orders from the previous episode. Pappa Tywin Lannister (who, in a brilliant piece of on set busy work, is skinning a dear) berates Jaime before ordering him to take an army and attack Catelyn Starks home land (the Tully lands) for kidnapping Tyrion (I guess no one told them he was released last episode). 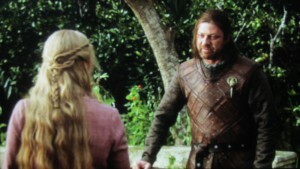 Ned calls Queen Cersei to tell her he found out about her incestuous relationship with her brother. 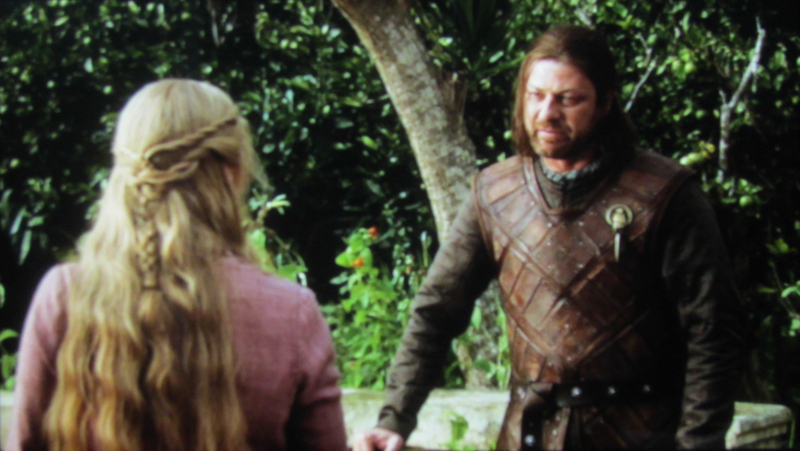 He informs her that he is going to tell King Robert that Joffrey is not his son, and gives her time to flee the town. Across town in a whorehouse, Petyr is giving tips to the redheaded prostitute from Winterfall, as he exposes to us his secret love for Catelyn Stark, and how he may not be as good of a friend to Ned as he leads us to believe. This brings us to the wall where sad Jon Snow likes to stand real close to the edge of the wall. He sees his uncles’ horse return, but without his uncle. 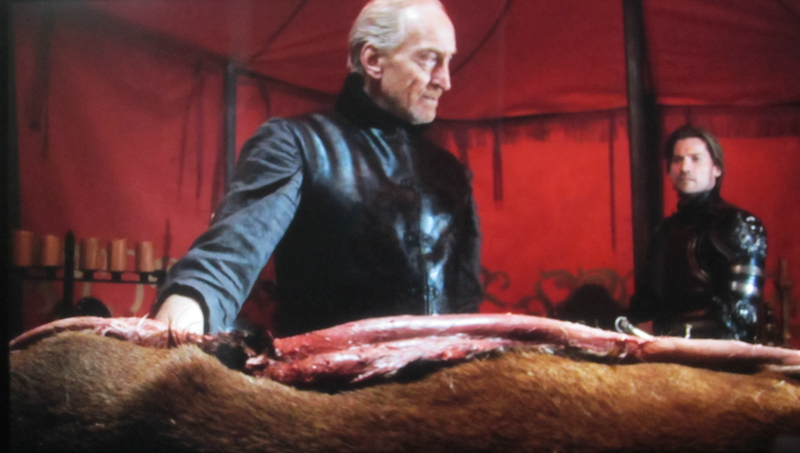 King Robert got himself gored by a boar after drinking to much wine (served to him by the Lannister kid) on his hunt. 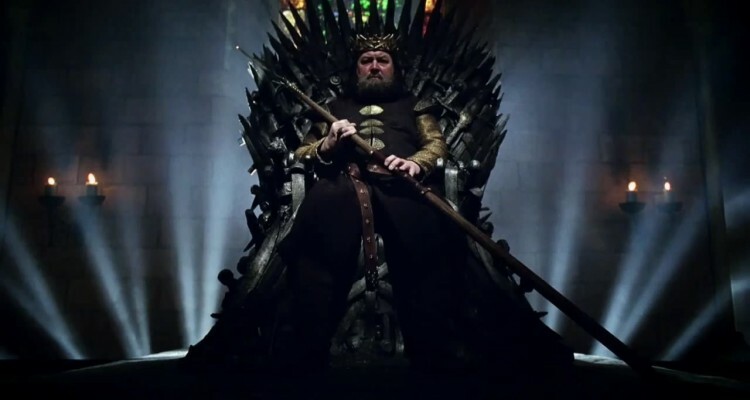 King Robert has Ned write his will in which he declares Ned as “Protector of the Realm” until such time as Joffrey comes of age. Ned write “rightful heir” instead of Joffreys name, but doesn’t tell Robert that Joffrey is not his son. 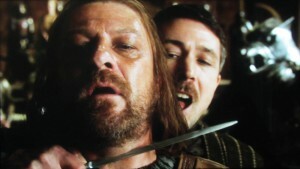 Ned try’s to call of the hit on Daenerys, but is told it is to late. He then has them give Robert some opium to ease his pain, and is off to figure out how to proceed. 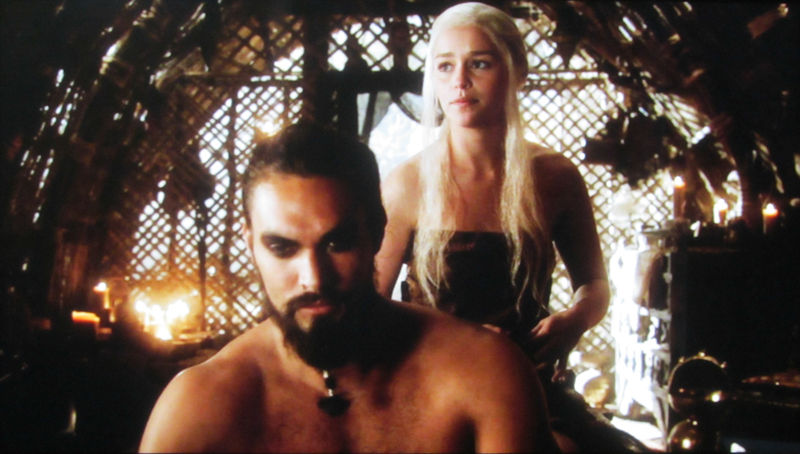 Back in the land of the horses, Drogo sees no reason to cross the narrow sea, and take back the 7 Kingdoms, and the Iron Throne for his bride. Daenerys, like many women do when they aren’t getting what they want from their husbands, goes shopping. Jorah sneaks away from the shopping trip for a moment to check his mail, and finds a messege that he has been pardoned. Knowing the implications of this, he rushes back to find Daenerys. Daenerys has found a wine merchant who, upon discovering her identity, offers her some “special” wine. Jorah trys to make the guy drink his own wine, and when he refuses and tries to flee, they realize he was trying to poison Daenerys. This really pisses Drogo off, and he now declares that he will sail across the sea and take the Iron Throne from the people who tried to kill his wife and unborn child. The brave trainees of the Nights Watch prepare to take their oaths. Jon gets pretty pissed when he finds that he has been assigned Seward duty to be the chiefs errand boy. He almost quits until fat Sam (didn’t Sean Astin play this guy in LOTR?) explains that they are grooming Jon for command. Jon, Sam, and some other Nights Watch dudes ride out to some tree with a face in it to take their oaths and become Knights of the Watch. After the recite their oaths, John pet dire wolf comes out of the bushes holding a frozen hand. Everybody stops by to talk to Ned and give them their advice on how they should rule. Ned however, wants to do things the “right” way. He call Petyr who try’s to talk him into making peace with the Lannisters, and letting his daughter marry Joffrey so the Starks and Lannisters can rule together. 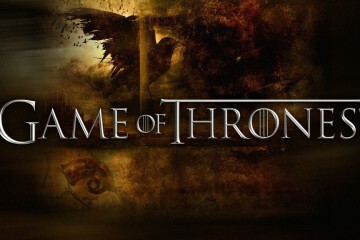 Ned will have no part in it and asks Petyr (as the treasurer, and guy who pays the city guard) to get the city guard to stand behind him when they confront Cersei and Joffrey. When Ned arrives at the throne room for the confrontation, Petyr greets him and assures him the citys guard are on his side. However, when the innevetable confrontation happens, the citys guard turn on Ned, and Petyr himself holds the blade to Neds throat reminding him “I did warn you not to trust me”. Man these are some unscrupulous bastards on this show.